The sword that caught the attention of the world before Partition of the country is gathering dust in the house of Master Tara Singh (Masterji), who had occupied the centre-stage of the Sikh politics for more than five decades. Master Tara Singh’s photo captures him in contemplative mood. Mr Tarlochan Singh, Chairman, National Commission for Minorities (NCM), says that Master Tara Singh was the leader of the Akali Dal and the sole spokesman for the Sikhs from pre-Partition days till his death in November 1967. Master Tara Singh was born as Nanak Chand on June 24, 1885, at Haryal village in Rawalpindi district of North Western Province of undivided India. He was born in a Punjabi Hindu Malhotra family. Life has been thrown out of gear owing to frequent and long power cuts coupled with sweltering heat here. People from all walks of life have complained of erratic power supply, which has disrupted their normal life. Life’s many shades: Braving the searing heat, these girls venture out with the protective covering of an umbrella. The rickshaw puller, however, has to sweat out in hot sun. The socio-economic development of women is the development of the entire human society. A traffic awareness workshop was held in the Art Gallery here recently. The increasing traffic problems in the holy city and its possible solutions were discussed. Mr S.K. Sharma, IG Traffic, was the chief guest on the occasion. The Art of Living, Amritsar Chapter, organised a whole gamut of activities at DAV International School here from June 6 to 11. The two-day Principals’ Workshop conducted by Guru Nanak Dev University recently dwelt upon the need for assessment and accreditation of colleges. New hope beckons youth of Vain Pauin village, near Goindwal-Khadoor Sahib, and 25 surrounding villages with the opening of a free community polytechnic centre that was inaugurated recently. The hundred-year-old Shivala Kashmiri Panditan, a historic edifice of the Kashmiri Pandits built by Pt Kashmira Mal Mattoo, is not only a symbol of their centuries-old rich cultural heritage, but is also the nerve centre of the socio-cultural and religious activities of about 70 Kashmiri Pandit families residing in this city. The local zonal office of the Confederation of Indian Industries (CII) would host a seminar on “Financing small-scale industry (SSI) for competitiveness” on June 24 here. Mr Deepak Mittal, Managing Director, Sonalika Tractor, has donated Rs 50,000 to the Chinmaya Mission’s monthly widow ration scheme. Speaking on the 35th monthly ration distribution function, Mr Mittal said that he was indeed impressed by the efforts of the mission that had come to the rescue of needy women. Success favours those who work hard. This was proved when Om Prakash, son of a migrant rickshaw puller from Bihar, bagged the 36th position in the recently declared matriculation results of the Punjab State Education Board. 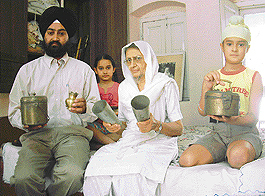 Mr Mandip Singh (extreme left), grandson of Master Tara Singh, shows traditional utensils that were used by the Sikh leader. 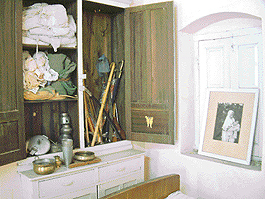 Swords owned by Master Tara Singh can be seen in the old cupboard. Doorway to history: A view of Master Tara Singh’s room. The new portion of the house is being used by his family. Raising the slogan “Pakistan Murdabad” (Death for Pakistan) in front of Punjab Assembly, Lahore, on March 4, 1947, by brandishing this black coloured sword, which was the trademark of Masterji, earned him many enemies. The fury of the fanatical Muslims against Tara Singh was so intense that his house in his ancestral village, Harial, in Rawalpindi district (now in Pakistan), was burnt down and 59 of his relatives hacked to death. However, the historical weapon has yet to find a proper place in a museum. Earlier, on March 3, 1947, Master Tara Singh, along with about 500 Sikhs, had declared “Death to Pakistan” at Lahore by holding this sword. Consequently, about 50,000 strong Muslim crowd went berserk outside and Masterji and his men narrowly escaped death. Ms Jaspreet Kaur, grand daughter-in-law of a Panthic leader who has done her Ph.D on Master Tara Singh, says that he is remembered for steering Sikhs towards opting for India in 1947 and also for the campaign for the state of Punjab in independent India. However, his own party and the SGPC seem to have forgotten the ‘Betaj Badshah’ (the uncrowned King), she adds. Masterji was one of the great leaders instrumental in the formation of the SGPC and SAD. While at last the nation paid tribute to the memory of one of its great freedom fighters by adorning his portrait in Parliament’s Central Hall on August 21, 2003, the Sikh Panth has yet to recognise his services by raising suitable memorial. Neither the SGPC nor SAD has come forward to open museum where belongings of Master Tara Singh could be preserved and displayed. The cupboard of Master Tara Singh, kept in the old structure of his house, remains locked most of the time. It contains a number of swords, including a samurai (Japanese sword), most of them gifted to him during functions, along with Siropas (robe of honour). The indifference of the SGPC and Shiromani Akali Dal notwithstanding, the family members of the legendary Akali leader are contemplating to turn a portion of his abode into a museum for the posterity. The family has been preserving a number of items, ranging from his personal use items to correspondence containing precious information and views regarding Partition. His grandson, Mr Mandip Singh, has these items including garwi, large-sized metal glasses, muffler, pens, passport, gold pocket watch, historical documents, including his correspondence with the British rulers and national leaders Mahatma Gandhi, Jawaharlal Nehru on burning topics like Partition and communal riots. Alas! His pocket watch got partially burnt in the 1984 anti-Sikh riots in New Delhi. A plastic pipe and funnel, kept in the old structure of the house, shows the humble way of living of the towering Sikh leader who used them as hearing aid in his old age. He was in the habit of writing his thoughts in diaries of which some pages are now available. Some of the pages of his diary written in Punjabi read that Pakistan would attack Jammu and Kashmir. These words proved prophetic after a year of Partition. Another page of the diary reads —— America was instigating Pakistan and provided it (Pakistan) with arms and ammunition. These are the historical documents that need immediate attention. The cupboard also contains a white coloured bulletproof jacket given by the then British Deputy Commissioner of Amritsar in 1947 after the breaking of communal riots. Masterji’s walking sticks and utensils are other articles of importance, which he used in Dharamshala jail while fighting for Punjabi Suba. Besides, he had in his possession one 12-bore double barrel gun and a 3.3 gun. His correspondence with the famous Cripps Mission, which visited India in 1942, showed again his concerns about the rights and safety of the Sikh community. The important papers included a Shiromani Akali Dal resolution passed on March 22, 1946, demanding an independent Sikh state free from the subjugation of any theological state. In post-independent India, his communication with various ministers and leaders illustrated his concerns about the adequate representation of Sikhs in various jobs and also his demand for the Punjabi Suba. Is there any leader today who can take pledge to remain pauper throughout life? This was true in case of Master Tara Singh, who served his community and nation selflessly. The ordinary hand-made cot where he used to sit while meeting people kept in his room also shows his humble lifestyle. Though he was not a man of means, but he had the will, perseverance and honesty of purpose, and that helped him occupy the centre-stage of the Sikh politics till his death. Masterji took pledge to serve the nation and the Sikh Panth by remaining poor when he was a student of Khalsa College, Amritsar. His credentials as a national leader could be ascertained from the historical facts. During the Round Table Conference at Shimla, convened by the then Governor-General, Lord Wavell, after the end of the Second World War, Master Tara Singh argued that the creation of Pakistan would be more injurious to his community than to any other community. He was among the twenty-one Indian leaders invited for the high profile conference to ease the surcharged political atmosphere. He made many enemies by opposing the creation of Pakistan. Sikh leaders like Tara Singh did indeed have a great foresight by not believing in the private concessions of Jinnah. Hindu leadership, including Bhim Sen Sachar, Gopi Chand Bhargava, Mahasha Krishan, and Mahasha Khushal Chand, formed an anti-Pakistan front, with Master Tara Singh as its leader. Though Master Tara Singh was a great freedom fighter, yet his family members have not taken any benefit from freedom fighters’ quota so far. Tara Singh had a bright educational career and was a scholarship holder throughout his academic years. In 1907, he passed his B.A. examination from Khalsa College, Amritsar. He remained captain of the college hockey team for three years. Later, he joined as headmaster of Khalsa High School, Lyallpur, at an honorarium of Rs 15 per month. Since then he came to be known as Master Tara Singh. The Nankana Sahib tragedy came as the turning point in his life and he plunged into the Sikh politics by saying goodbye to teaching. He also edited two Akali newspapers — Akali (Urdu) and Akali te Pardesi. He took an active part in national politics till his death on November 22, 1967. Few people know that Master Tara Singh was a prolific writer. He authored two novels — Prem Lagan and Baba Tega Singh. He was also the author of Garihst dharm sikhiya, Piram pyala and Kio varni kiv jana. He also penned travelogues. He had such authority that one word from him could seal the fate of millions of Hindus and Sikhs. The NCM Chairman says next to Maharaja Ranjit Singh (1780-1839), no Sikh had such vast influence on the community as Master Tara Singh. “Every Sikh leader of the modern times was, in fact, his creation. At one time, Partap Singh Kairon was his secretary. India’s first Defence Minister, Sardar Baldev Singh, was his nominee. Sardar Swaran Singh was made a minister and leader of the Akali Assembly Party in Lahore by him. Sardar Hukam Singh, who rose to be the Speaker of the Lok Sabha, owed his entry into parliament to Masterji. Sardar Buta Singh was picked by him and made Member of Parliament in 1962. The British tried to influence Sikh leaders to side with the Muslim League. Jinnah went all out to win over the Sikhs and offered them an autonomous state within Pakistan. Master Tara Singh spurned all offers and announced his decision to stay with India. Bengal’s leaders, N.C. Chatterjee and Shyama Prasad Mukherjee, acknowledged the support of Masterji after their successful campaign in getting half of Bengal integrated into India. This valiant fighter for freedom remained active and went to jail many times in free India, demanding re-demarcation of Punjab on linguistic basis. Master Tara Singh was born as Nanak Chand on June 24, 1885, at Haryal village in Rawalpindi district of North Western Province of undivided India. He was born in a Punjabi Hindu Malhotra family. It is indeed remarkable that from humble origins he rose to the top of Sikh leadership, culminating with the creation of Punjabi State in independent India. His mother, Moolan Devi, was a pious lady and his father, Bakshi Gopi Chand, was revenue patwari. In the beginning of the 20th century (1902), Nanak Chand embraced Sikhism and came to be called Tara Singh. Life has been thrown out of gear owing to frequent and long power cuts coupled with sweltering heat here. People from all walks of life have complained of erratic power supply, which has disrupted their normal life. They lashed out at the government for “enhancing rates of power now and then, but failing to provide adequate power supply”. Ms Jaspreet Kaur, a homemaker, said their life had become miserable due to frequent power cuts. She said children particularly had a tough time. Her sentiments were echoed by many other city residents. The residents are also complaining of inadequate supply of water. They say that erratic power cuts have made water a rare commodity. In such a scenario, the decision of the Punjab State Electricity Regulatory Commission to hike the power tariff by 10.27 per cent has come as a rude shock. Amritsar Tea Traders’ Association, have criticised the decision. Besides, political organisations like the Communist Party of India (Marxist) and the Bhartiya Janta Party have held protest marches. The industrialists resented that unannounced power cuts were crippling the industrial units. They said that they had to resort to the use of gensets that increased their costs of production, and they also had to reschedule the entire production, besides paying heavily to the labour. As such, they were unable to meet the requirements of the buyers, both international and domestic. They lamented that the state government lacked vision in managing the power crisis that plagued the state owing to faulty policies. “The government has not bothered to invest in the power generation sector in view of the 10 to 15 per cent annual increase in the power consumption,” rued an industrialist. Lawrence Road, often use generators. This adds to air and noise pollution. The socio-economic development of women is the development of the entire human society. Stating this socio-economic development as its objective, the Small Industries Service Institute, Government of India, Ministry of Small Scale Industries, Ludhiana, in association with the All India Women Conference (AIWC) and the District Industries Centre, Amritsar, conducted an industrial motivation campaign “Self-Employment Campaign for Women”. Ms Ranjit Kaur Chatha, president, AIWC, emphasised upon women empowerment in the changed world scenario. She discussed the strategies to be adopted for ensuring social justice and for increasing opportunities for women to be self-reliant. She said the main aim of the campaign was to motivate the women to seek self-employment opportunities by setting up their own small ventures. By adopting selected income-generating activities, the women could gain economic freedom and find employment not only for themselves, but they could also create employment opportunities for others. Mr K.S. Ludu, IES, Additional Development Commissioner (SSI), Government of India, stressed on the importance of women’s participation in economic growth. He said there were various opportunities available to women in small-scale sector. Mr R.C Chopra, director, Small Industries Service Institute (SISI), Ludhiana, briefed the audience about the role of SISI in making the women self-employed. He motivated the women to work for the economic development of the country. Mr D.P. Bhagat, general manager, District Industries Centre, Amritsar, discussed in details the schemes and incentives provided by the state government. Mr J.S. Bhatti, district manager, Khadi and Village Industries Board (KVIB), said the board was engaged in uplifting the status of women in rural areas by promoting the products made by the women in the rural areas. He said their board was purchasing the goods manufactured by these women and putting up the goods for sale in the KVIB shops at various places in the state. Mr Ashok Gupta from the Union Bank of India said generally the women did not come forward to start their own enterprise due to lack of funds. He discussed the special schemes launched for women to enable them to secure easy finance for their ventures. A traffic awareness workshop was held in the Art Gallery here recently. The increasing traffic problems in the holy city and its possible solutions were discussed. Mr S.K. Sharma, IG Traffic, was the chief guest on the occasion. Mr H.S. Randhawa, DIG, Border Range, Mr R.P.S. Brar, SSP, Mr D.P. Singh, SP Traffic, and Mr K.S. Kang, Municipal Commissioner, were also present. Mr D.P. Singh said that Amritsar was an old city with narrow congested roads, especially in the walled city area. He added that renovation of bus stand, inadequate parking facility, use of pressure horns, intermixing of kerosene oil in petroleum products had added to the problem. Mr Surjit Sharma, president, Rotary Club, Amritsar, said that only the three Es — Engineering to build infrastructure, roads and parks, Education to educate masses about traffic laws and penalties for disobedience, and Enforcement to strictly impose penalties on defaulters — could offer a possible solution to the problem. Mr G.S. Majithia, executive engineer, Pollution Control Board, expressed the view that noise pollution remained unchecked in the city. He suggested that silence zones be made near residential areas, hospitals, educational institutes and religious places. Along with this, green belts should be developed in commercial areas to reduce pollution. A member of the National Road Safety Council of India, Mr Shyam Sundar Juneja, stated that traffic problem was directly effecting the environment. He said that proper tests as per the Motor Vehicle Act be conducted before awarding licenses. Giving the record of accident cases, DIG, Border Range, said that about 255 accidents cases were registered over the year in the border range during which 192 persons died, while 269 were injured. The figure was much higher than the number of murder cases registered in the same period. Mr S.K. Sharma, while interacting with the students of Spring Dale Senior School, said that he had recommended to the government to make traffic education compulsory for school students. But he reiterated that one must not wait for government to issue orders and directions for bringing in change. The IG said there was no agency taking care of the post-accident jobs like removing the injured and the dead from the scene of the accident. NGOs like the Society for Accident Aid and Traffic Health (SAATH) had a great role to play by spreading awareness in that regard, he added. A poster-making competition on road-safety was organised, followed by a presentation by commerce students. Mr Sharma appreciated the exhibition and posters made by about 70 participants. The winners of the competition were given prizes by Mr Sharma. Shefali Mahajan of Spring Dales School won the first prize, while Khushboo Sharma of DAV International School won the second prize in Class VI-VIII category. In Class IX-X category, both first and second prizes went to students from Spring Dales School — Harnoor Saini and Amiteshwar Singh, respectively. In Class XI-XII category, Sumati Arora from Spring Dales School bagged the first prize, while the second prize was won by Rajwinder Kaur from Police DAV School. Kirti Chawla from Spring Dales School was given the consolation prize. A six-day workshop was conducted by Mr Anish Dua from Guru Nanak Dev University. The workshop aimed at the holistic wellbeing of an individual. The participants learned the finer points of yoga, meditation and Sudershan Kriya — a process through which millions of people worldwide have claimed to have been benefited. Nav Chetna Shivir, a five-day workshop that commenced on June 7, was also conducted at the school for the educationally underprivileged and the socially backward sections of the society. The programme aimed at teaching the participants about good health, personal hygiene and harmony. The participants were taught breathing exercises, meditation and the ways and means to a more beautiful self and environment. The Art of Excel, a six-day workshop on the all-round training in excellence, commenced on June 13. The workshop was open to all children in the age group of 8 to 14 years. The participants learned about dealing with stresses of modern life, overcoming shyness and nervousness, discovering talents, enhancing confidence and aptitude through specific breathing exercises, meditation coupled with lively games, and educative interactions in a joyful and relaxed atmosphere. A 15-day summer camp was also organised in the school from June 6 in which creative skills of students were enhanced and they were taught gift-wrapping, art, computers and cooking. The students enjoyed the tonga ride. They took part in dance and scripted their own themes for drama. To make the summer camp more interesting, the students were taken for a picnic to the Verka Milk Plant and were also shown a movie. Speaking on the occasion, Mr Ganesh Hagde, Assistant Advisor, National Assessment and Accreditation Council (NAAC), Bangalore, dwelt upon the role of NAAC in the assessment and accreditation of colleges and quality education. He talked about apprehensions and expectations of colleges vis-à-vis NAAC, and also discussed how the accredited institutions could avail of Memorandum of Understanding with foreign universities and other institutions and vice versa. Dr S.K. Bhatia, Director, Academic Staff College, speaking about the relevance of orientation and refresher courses, sought the cooperation of the college principals in allowing their teachers to join these courses for updating their knowledge. Earlier, Dr N.K. Jain, Joint Secretary of the University Grants Commission (UGC), while inaugurating the workshop, gave details of various UGC schemes and the grants available to the colleges under such schemes. The principals expressed their appreciation for organising such workshops, and thanked the UGC as well as the varsity authorities for providing them valuable information about various UGC schemes. The polytechnic would offer diploma courses in computers and stitching, designing, textiles, besides embroidery. Aimed at making jobless youth vocation-oriented, it would help to wean them away from anti-social activities, especially drugs and alcohol addiction. The polytechnic centre has been started by the Akal Purukh Di Fauj, a Sikh organisation undertaking charity work, in collaboration with Ms Narinder Kaur, Principal and owner of Guru Amardass Public School, a private institute in the village. 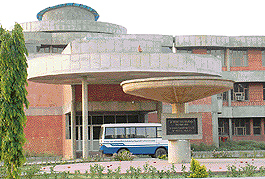 The centre is located on the school premises. It was inaugurated by Mr Jaswinder Singh, an advocate and senior member of the SGPC, and Ms Narinder Kaur. The diploma courses offered here are in collaboration with Government Polytechnic Institute, Amritsar, under the District Community Polytechnic Scheme. The centre would cater to the training of youngsters from 25 villages, including some border villages. These include Nagoke, Surlli, Ekkal Gadd, Fatahbvad, Kang, Kallah, Baath, Mal Chak, Muglani, Dulchepur villages. The centre would also provide all material necessary for learning free of cost. As many as 10 computers have been installed for the purpose. Four batches of 20 students each would be enrolled for the course. The course is open to both girls and boys who have completed their matriculation. In the stitching, designing and embroidery course, only girls who have studied up to class VIII would be admitted. As many as 15 sewing machines have been installed and four batches of students can undertake the course for the diploma period. Mr Jaspreet Singh, media coordinator of the fauj, said the courses were open to young persons belonging to any religion. He said a generator set had been installed and the centre would not face problems due to power shut down. The fauj, along with the private school, proposes to extend the centre to a full-fledged polytechnic by offering other vocational courses, including motor mechanic, electrical and electronics repair. The Akal Purukh Di Fauj is already associated with other charitable works, including running a free Sahibzada Ajit Singh De-addiction Centre at Chheharta and one such centre at Ghuman in Gurdaspur district — both areas notorious for drug addiction. The organisation also runs Sahibzada Fateh Singh Mission Hospital in Roopnagar here where a dental clinic and clinical laboratory offers services free of cost. Bhai Ghaniyaji Free Ambulance Service is also being run by the fauj. These shocking ‘revelations’ come from Dr B.L. Goyal, former director of Dr Vidya Sagar Mental Hospital. Dr Goyal, while talking to The Tribune, said that as the director of the institute in January 2001, the most daunting task before him was to tackle the staff’s autocratic behaviour towards helpless patients suffering from multiple mental illnesses. Besides this, absenteeism, disobedience and insubordination had become the style of functioning among the staff, he added. Some of these employees were transferred to cleanse the system. A class IV employee who had “odourised” a patient was dismissed. Another who had brutally beaten up a woman patient also met the same fate. “This action against the erring staff brought some semblance of discipline and fear of law among the employees,” he revealed. In addition to this, medicines being provided were “outdated”, primitive and grossly inadequate in quantity, he added. “The electric shock treatment was repulsive and was administered to patients without anesthesia. Patients were examined by non-specialists in OPDs,” said Dr Goyal. Another shocking disparity that was prevalent for years was the distribution of food in two categories — ‘ordinary diet patients’ and ‘better class diet patients’, revealed the former director. Talking about the mental hospital’s inception, he said that from 1950 to 1965, the institute enjoyed a good reputation. However, after the departure of Dr Vidya Sagar — its first medical superintendent — it grew worse in the absence of a proper monitoring system. With shocking reports about the institute emerging in print media, a suo moto notice was taken by the Supreme Court in 1997. Subsequently, an inquiry by the State Human Rights Commission was initiated. Recommendations submitted by a four-member committee helped to fill the majority of the MO Cadre posts with psychiatrists. Finally, after scrutiny by the government in the year 2000, positive changes were recommended. Dr Goyal took over as the director of the institute barely six months after his superannuation as Principal, Government Medical College here. He brought about sweeping changes in the institute that was earlier plagued with strikes and agitations. The changes included streamlining treatments, disciplining staff, equalising diet charter, upgrading laboratory for psychological testing and introducing recreational activities with an aim of rehabilitating the patients. Training in stitching, embroidery, music, flower-vase painting, candle-making and preparation of detergent powder, phenol, mattresses was given to the patients. Sharing his vision to transform the hospital (spread over 28 acres of land) into postgraduate institute of mental health to make it a teaching institute, Dr Goyal said his proposals had already been approved by the government. By the end of the 19th century, the population of the Kashmiri Pandits in Amritsar became quite substantial and need was felt to have a proper place for religious and social gatherings to strengthen the community bonds. Pt Mattoo, who had a roaring legal practice in the beginning of the 20th century, floated the idea to build the Shivala, perhaps on the suggestion of his priest, Pt Shanker Guru. It instantly got the full support of the community. Since localities like Chowk Farid and Kucha-e-Kashmiri Panditan were having the maximum concentration of Kashmiri Pandits, Pt Mattoo donated a piece of prime land in Chowk Farid area in 1908 to start the construction work of the proposed Shivala. The other community members also liberally donated money for the noble cause. Consequently, the present holy structure came into existence in 1910 in Chowk Farid. 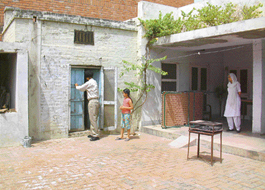 The land for this Shivala and allied buildings was purchased from the Amritsar Improvement Trust. Initially, two rooms were built in this temple complex to provide accommodation to Kashmiri Pandit pilgrims visiting the city. 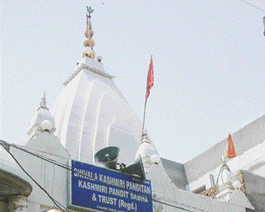 Soon this temple started attracting a large number of pilgrims, both Kashmiri as well as non-Kashmiri. At the initiative of Rai Bahadur, Pt Behari Lal Kitchlu and some other prominent Kashmiri Pandits of the city, a body known as the Shivala and Trust Kashmiri Panditan was duly registered with the Punjab Government. After Partition in 1947, communal riots broke out in Punjab and the city witnessed loot, arson and bloodshed. The historic building of the Shivala was gutted in the communal frenzy and its precious records were lost. A large number of old resident Kashmiri Pandit families migrated from Amritsar to other places for safety. After the restoration of peace in the city, an attempt was made by a team of dedicated workers to retrieve whatever was left of the old records from the debris. Presently, this historic Shivala of Kashmiri Pandits is under the control of Pandit Sabha of Amritsar. Its managing committee consists of Pt V.K. Magazine, Pt Rajesh Raina, Pt A.K. Jan, Pt O.N. Kaul, Pt Ramesh Bakshi, Pt Durga Nath Kaul and Pt Jagdish Kaul (Punjabi). The president of the sabha, Pt Magazine, while talking to this reporter, said that many tourists from different parts of the country stayed in the rooms in the Shivala complex. He further said that Muslim patients from the Kashmir valley who came to the holy city for treatment, stayed at the Shivala complex by paying a nominal fee. He said that Kashmiri Pandits had also built the Shivala at Katra Dal Singh behind Sri Harmandar Sahib. It was built in 1914. This Shivala was also under the overall management of the Kashmiri Pandit Sabha, Amritsar. He said the Shivala, till recently, had been in a dilapidated condition. Pt Magazine said the new committee had chalked out an ambitious plan for the development and extension of both Shivalas. He hoped that with the help of philanthropic persons like Ms Lakshmi Kanta Chawla, the local BJP MLA, and Mr R.L. Bhatia, former MP and Governor of Kerala, who had donated Rs 300000 and Rs 50000, respectively, the managing committee of the Shivala would be able to fulfil their dream project. The chairman of the local chapter of CII, Mr Gunbir Singh, said Punjab Finance Minister, Mr Surinder Singla, would preside over the day-long seminar. He said that the SSI sector had emerged as the most vibrant sector. Providing adequate credit facility from various banks as well as financial institutions would go a long way in giving SSI a competitive edge, he added. He said senior officers from various banks, including the UTI, the Bank of India, the State Bank of India, SIDBI, Exim Bank and Punjab Financial Corporation, had been invited to make presentations at the seminar. During the seminar, experts would also interact with entrepreneurs. Mr Mittal suggested that these women should set up small economic groups with the help of self-financing schemes offered by various banks. These kinds of ventures would help them to be economically self-reliant, he added. Ms Rachita Bhandari, IFS topper among the women candidates in the country, in her emotionally-charged speech said that she had offered to always stand by these women in their hour of need. She added that it would be in the interest of the society to contribute liberally for their wellbeing. The secretary of the mission, Mr Avinash Mahindru, said the mission had been able to sustain the ration distribution programme through the help of various philanthropists and voluntary organisations of the city. He urged the public to donate generously for the noble cause. Om Prakash, a student of DAV School, Hathi Gate, was overcome with emotion when he talked about his success. He barely managed to mumble that he would like to be a doctor so that he could pay back the debt to the people and the society. Echoing the sentiments of Om Prakash, his father Satnarayan said it was his dream to educate Om Prakash. He said his son had been a bright student from the very beginning. “It was through sheer hard work that he managed to achieve this success,” he said. He added that people in the locality had helped his son to continue his education. “Had it not been for good Samaritans like Dr Yadvinder Singh who encouraged my son and even provided him financial help, my son may not have been able to do so well,” he said. He lauded the role of the school and its Principal, Mr J.P. Shoor, for providing all possible help, including books and stationery, besides monetary help. He said the teachers and other faculty had been extraordinarily kind to his son by giving him extra coaching. Om Prakash, while narrating his success story, said that after school hours he used to regularly put in eight to ten hours of self-study daily. Although he had obtained 87 per cent marks, securing 565 out of 650, yet his biggest achievement had been getting 96 per cent in science. He regretted that in mathematics he could get only 84 per cent. As he felt that he was inclined towards medical science, he said he had opted for the same for his further studies. He said the school had already offered him a scholarship and other benefits to complete Plus Two. He also had a word of thanks for many philanthropists, including Mr Gupta, a chemist. He said his family hailed from Madhubani, a backward district of Bihar. “My dream is to be a competent doctor. Hope I will be able to make it true. I believe strong determination is the key to success,” he added. Meanwhile, Mr Shoor said that the school would fully back the efforts of Om Prakash, who would be provided extra coaching in all subjects free of cost, besides monetary help.